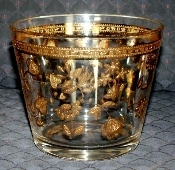 Vintage From Paul is pleased to offer this vintage 22 Carat Gold Culver Glass Eames Era Gold Encrusted Ice Bucket. The Culver Glass Eames Era Gold Encrusted Ice Bucket is in Mint condition with no chips, cracks, scratches. The graphics are crisp, the colors vibrant, the gold banding intact. The Culver Glass Eames Era Gold Encrusted Ice Bucket stands 4-7/8 inches in height and measures and 5-3/4 inches in diameter at the top. This Culver Glass Eames Era Gold Encrusted Ice Bucket would make a nice addition to any Eames era, Mid-Century or Culver Glass Collection!